Should I Do Search Engine Optimization (SEO) or Pay Per Click (PPC)? Should I do Search Engine Optimization(SEO) or Pay Per Click(PPC)? If you’ve been in business online for even a minute, you’re already familiar with your need to capture new audiences via the Holy Grail of Internet marketing: the search engine. Search engines like Google and Bing direct users towards your site – and thousands of others – every day when users enter search terms like “shoes for sale” or “learn to code”. Each search generates pages of results that pertain to some degree to the thing that the user initially wanted to find. When it comes to getting noticed through search engine searches, you need to boost your site’s search engine rankings in order to move up the ranks to the top of page one when a user enters a keyword related to your brand. But it’s not all that simple. Companies have been competing to be number one in search engine rankings since the day search engines were invented. Or, at least as soon as someone realized that rankings equal more site traffic, which usually equals more business. Getting to the top of the pile doesn’t happen by a stroke of luck or some magical happenstance – it requires work and strategic planning, which is how we’ve arrived at today’s topic: Search Engine Optimization (SEO) and Pay Per Click (PPC) advertising. SEO is an Internet marketing term that many businesses and web gurus throw around without actually understanding in great detail. On its face, the concept of SEO – that is, optimizing search engine results to favor your website – isn’t all that complicated. However, when you’ve got a lot of players vying for the same position, SEO becomes much more than a simple concept. 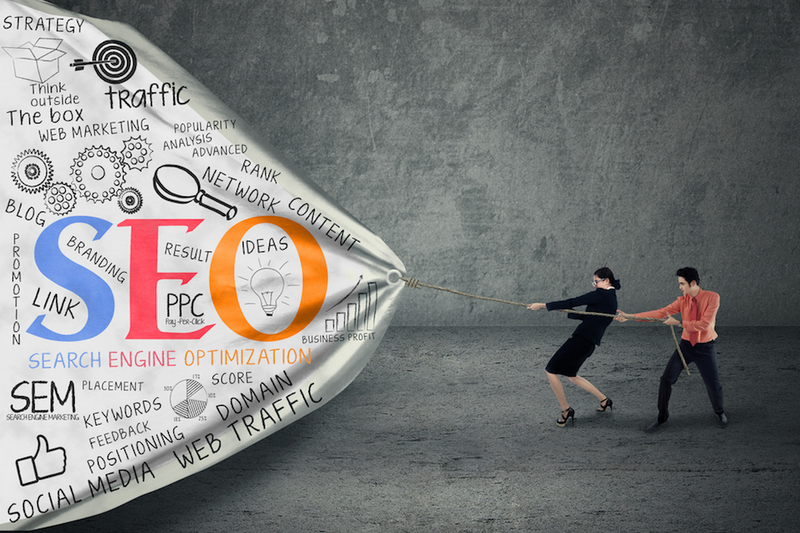 SEO involves strategic planning to get your site and pages to the top of the pile organically. This involves having relevant content that people want to see and having a core of users that interact with your site often. Concepts like keyword placement and up-to-date pages also play a role in keeping your site on the up and up – both with your customers and in the search engine rankings. Don’t expect your website to attract customers overnight, though. Barring some chance virality, your site is likely going to remain fairly inconspicuous until you as the business owner put in the work that it takes to drive it up in the SEO rankings. You need to strategically update your page, often, and include relevant information for your customers. Keep pages fresh and free from clutter like broken links to get the most out of your browsability and web page legitimacy. If you stay on top of the factors and continue to drive users to your site through email lists, social media marketing and other campaigns, you’ll notice your ranking improve. However, even if you’re doing everything right, if you’ve targeted the wrong keywords or take a step that’s very out of place for what customers expect from your brand, you may not end up where you want to be. Months of planning can lead to frustration when you realize that customers don’t want the things you’ve been targeting or that a tweaked version of a specific concept captures more interest than the one you initially chose. Rerouting and charting a new course can set your search engine strategy back to square one, if you’re not careful. PPC, on the other hand, is not a long-term game, and offers business owners the opportunity to test keyword success among their audience. PPC advertising works by business owners purchasing certain keywords from platforms like Google Adwords. Then, the business owners pay a certain amount of money each time a link to their site is clicked from a search for that term. For example, a Denver dental practice might purchase keywords related to their business offerings, like “invisalign Denver” or “cosmetic dentistry Denver” to help boost their local search results. Each time a search engine user enters one of the terms that the dental office purchased, the pratice’s website can appear at the top of the page, with an included banner or sticker that says “ad”. When a user clicks through that ad and lands on the site, the practice owes the search engine a predetermined amount of money. The more competitive the keyword, the higher the price. In our example, a keyword like “invisalign Denver” would be much more expensive than one like “cosmetic dental practice specializing in invisalign Denver, Colorado”, but would also be much more likely to be searched. If you specialize in a highly unique niche, choosing inexpensive and obscure keywords that your customers might actually search could pay off in big ways. However, for more popular fields and likely searched keywords, you’ll be paying a premium for ad space. PPC gives businesses, especially new businesses, the opportunity to quickly rise in search engine rankings. Overnight, your page can go from insignificant to page one for all to see when they enter your keywords. While this is a very attractive benefit, the value of PPC over the organic traffic derived from SEO success is different. PPC traffic is not organic, but “pay to play”. Is this to say that there’s no place for PPC marketing? Definitely not…PPC marketing is useful, particularly for short-term promotions, sales and for determining market interest in certain search phrases. It’s beneficially long-term if you (or a PPC management company) are continually refining and optimizing your campaigns to make sure they have a positive ROI. Overall, PPC is a fairly low risk way to generate new patients and clients. The only investment you make is when someone clicks on your site through an ad. If you anticipate that these leads will generate revenue for your company, then you’re setting yourself up for some serious success. Unless you have a rock solid SEO strategy that will nab sales and climb ranks or have a popup event that requires only the short-term investment of PPC, then your marketing strategy will likely benefit from using a combination of the two. One of the best ways to use PPC is to determine the level of keyword interest that your preferred audience has. It would be a shame to invest your entire SEO strategy around attracting patients or clients through “cheap at home toilet repair”, when what they’re really interested in is “emergency plumber service”. While the difference is subtle, it says a lot about your client base. “Cheap at home toilet repair” tells you that your target market is thrifty DIYers of any level of experience who have broken toilets at home. “Emergency plumber service” tells you that your target market are homeowners who probably want a plumber to come out, find the problems and make the repairs. They’re not as interested in saving money, but in having a professional do it. Choosing PPC campaigns that target each audience will illumine much about who’s interested in your business. You can keep track of metrics like who’s visiting your site and whether they’re making any purchases or filling out contact forms. If one performs better than the other, then not only can you use that information to hone your SEO strategy – as you should – but you can let that information influence your business plan, as well. In the end, while SEO and PPC are incredibly powerful traffic drivers on their own, they both perform best when used in combination. As you evaluate your niche market and how you might best attract clients, consider the times where PPC ads might be most effective, and use them to attract short-term interest, like when you’re running some type of promotion. Focus on your SEO strategy as your long-term marketing strategy to organically build your web presence and reputation.